When we think of picture books, we often think only of fiction. As I’ve delved into the treasure trove that is my local library’s picture book shelves, I’ve discovered a vast range of subjects in the non-fiction section. So many of them offer great soil for growing a garden of lessons for children in religious communities, in private schools, homeschools, or in therapeutic situations. As I’ve demonstrated many times here at PBT, picture books can encourage spiritual conversations and important social-emotional growth in children and adults. They can be particularly helpful when crises occur or difficult issues arise in faith communities. Using books (of stories, facts, or poetry) as therapeutic tools is called bibliotherapy. I learned this extraordinary word in my training as a school psychologist. I was already a lover of picture books. Because they are non-threatening, familiar, and imaginative objects, picture books can promote journeys of self-reflection and personal growth. 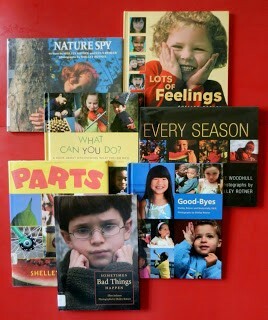 Today’s featured author, Shelly Rotner, has such a wonderful array of books, each with her delightful photographs! Children love looking at photographs so these books are very appealing. You can supplement a lesson or even build a series of lessons around one or more of her books. You might want to consider taking similar photos of your children as a part of your lesson. The kids (and their parents) would love that!